Newcomb Heating & Cooling provides air conditioning, heating, and home performance services to the residents of Vienna, IL and the surrounding areas. Read our reviews and find out why your neighbors consider us to be the experts for HVAC repair, replacement, and maintenance in Vienna, IL. The guys from Newcomb heating and cooling did a great job! They arrived on time and cleaned up after themselves. I highly recommend Newcomb for all your sprayfoam and HVAC needs. They had great service and came as soon as they could. They were very fast and efficient in getting our air conditioning unit back up and running. We called on Monday requesting a service call and they came on Wednesday to look at our furnace and we thought it was shot and were looking at probably a replacement. Ryan went above and beyond after looking at the unit he determined it was clogged and went up on our roof with wasp spray and a shop vac and thoroughly cleaned out the vent. Unit is working great again. Thanks for a great job guys! Great experience. He was very knowledgable and gave multiple solution options. Air conditioner is not cooling. Blowing out warm air. Low on Freon. Added r22 refrigerant and cleaned the condenser coil. Payne 80% gas furnace won’t ignite. Hot surface igniter was bad. Checked filter and replaced the igniter. Gas pressures are good. Air conditioner coil needs to be serviced. Evaporator coil needs to be cleaned. A Coil. Carrier heat pump is not heating. Outside unit is frozen up. Defrost board is bad on the unit. Emergency heat is working correct. Freon checked when operating correctly. Nordyne ac was not cooling. Bad capacitor. Put a new capacitor on and checked the freon. System had a leaking evaporator coil. Replaced it with a arcoaire coil that will have a 10 Year Parts Warranty and a 3 Year Labor Warranty. Carrier ac is not working. System is leaking refrigerant. Added stop leak and due to the system. Charged it with R22. Was not low on freon anymore. Bryant air conditioner not working. Control board was bad. Pressures on the refrigerant ok. Did not need freon. Spray foamed exterior walls with open cell spray foam insulation. Geothermal was also installed on the log cabin. System has all metal duct work with R6 fiberglass wrap. Installed a climatemaster geothermal system and sprayed the floor with closed cell spray foam. Sprayed Closed Cell spray foam on the south end wall. Nothing better insulates than Closed Cell foam. Bryant air conditioner is not cooling. We added r22 refrigerant and cleaned the evaporator coil. Needed a new filter. Carrier ac not working. Low on freon. Changed the capacitor. Goodman ac not cooling. Added freon. Needs a new coil and condenser. Dairy Queen has water leaking through the ceiling. The rooftop unit is not level and the drain is running the opposite way than needed causing it to leak back down into the building. Changed filters. Fixed carrier ac. Low refrigerant. Installed a new arcoaire 95% high efficiency furnace and 3 ton air conditioner. Summer tune up on two Armstrong air conditioners. Brushed the coils after washing the units. Everything looked good! 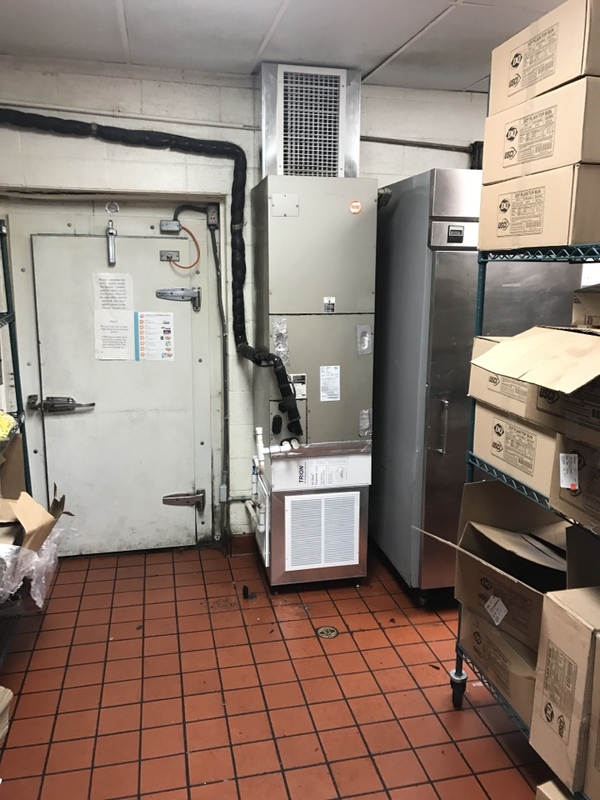 Dairy Queen AC freezes up. Cleaned it all up and added a airbear filtering system. Coil was getting blocked.